This ingenious sock design is completely reversible! As you knit, you create a delicate pattern of twisted travelling stitches; turn your completed sock inside out, though, and the fabric has a different, more subtle texture, which is equally pretty. 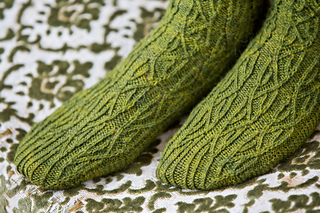 A garter stitch sole allows the socks to be worn either way around. It uses a hand-dyed yarn from Violet Green.